There is also a single very wide door (like five-feet wide) upstairs between the main bedroom and sewing room. Only the dining room pair works well. All the others open/close, but not easily. The very wide door is particularly difficult. I am the kinda guy who like things to work. So, if X goes wrong with my car, even something minor, I feel an urgent need to get it repaired. If I buy an old clock which is not working, it seems urgent that it be repaired. If I buy a huge old house needing a zillion repairs, well, you can imagine my reaction. It makes me a bit crazy that the pocket doors in the Cross House do not effortlessly glide as they should. In my search for What To Do, I came across Stephen Thorp, who has an amazing website. I have spent hours pouring over the arcane anatomy of pocket doors on the site. Quite happily. So, after many hours of research, I finally felt emboldened to tackle the annoying and quite disrespectful pocket doors of the Cross House. And was soon quite vexed. The pocket doors hang from double wheels in a U-track. The tracks have screws in the middle, and to each side. Adjusting the screws made a huge and instant improvement to some doors. Whoee! You are looking at the bottom of one U-track, and a single wheel is visible. There would be a matching wheel to the right. On several doors, it is evident that a wheel is missing. So, the weight of one end is being carried by one wheel rather than two. This makes the wheel angle to one side, which makes the door hard to open. It seems obvious that in order to replace the missing wheels, I need to remove the problem doors. But HOW do the problem doors come out????????? From what I can tell, the pockets doors were installed BEFORE the walls were built. And there is no way that I am going to demolish walls to repair errant wheels. No way! In the past, I have been able to remove pocket doors for repair. These doors could be pulled forward at an angle, then lifted slightly, and the wheels popped off the tracks. But these were single wheel situations, and with wheels not encased in U-tracks. I am crossing my fingers that Stephen will save me!!!!!!!! 12 Responses to ARGH! Making Pocket Doors Work. So, if you take off the trim above the door, does that give you access to the track and wheels? Behind the door trim is plaster on lath. Behind that is a wood “sleeve” which the doors slide into, like a pocket inside a pocket. Since the track is in sections, could you remove a middle section while the doors are tucked away, then easily sneak the door out to fix things? Either way it’t a luck problem to have, the previous owners of my 1904 Queen Anne took out the pocket doors and, well, entire wall between the parlor and dining room. There are two tracks per pair. A right track and a left track. They meet in the middle. There is no middle track to remove. Argh! It may take you a while to come around to it, but like the “wrong” sconces on the front porch, I suspect you will not be able to stand this and that wall destruction lies in your future, sooner or later. Best to just get it over with. I am confident that there is a solution out there. I just need to speak with a pocket door expert! Our pocket door rollers are in two pieces. One piece is the rollers, and the other piece is the part that attaches to the door. There is an adjustment between the two which allows you to raise the door up or down as needed. 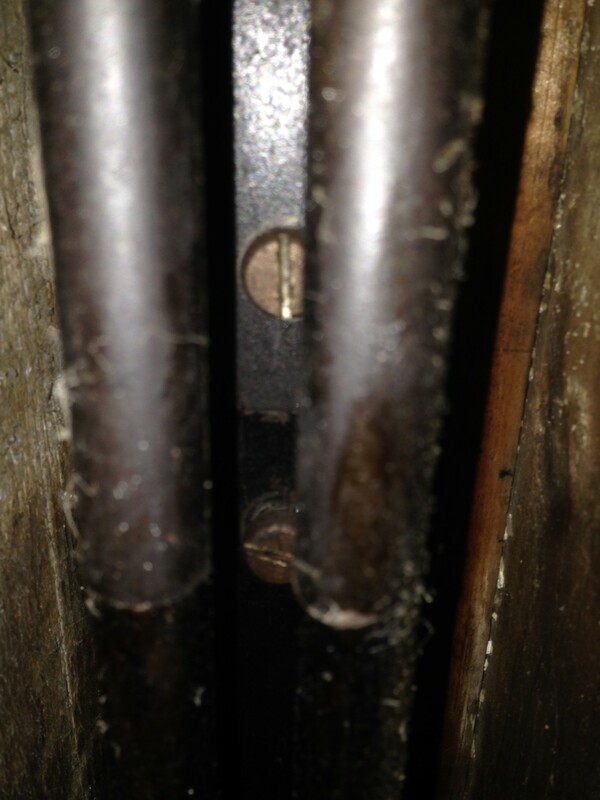 The bolt used to make this adjustment also comes out, allowing the door section to separate from the roller section. Where our two sections of track meet in the middle, there is a gap which will allow the rollers to drop out once it is disconnected from the door. 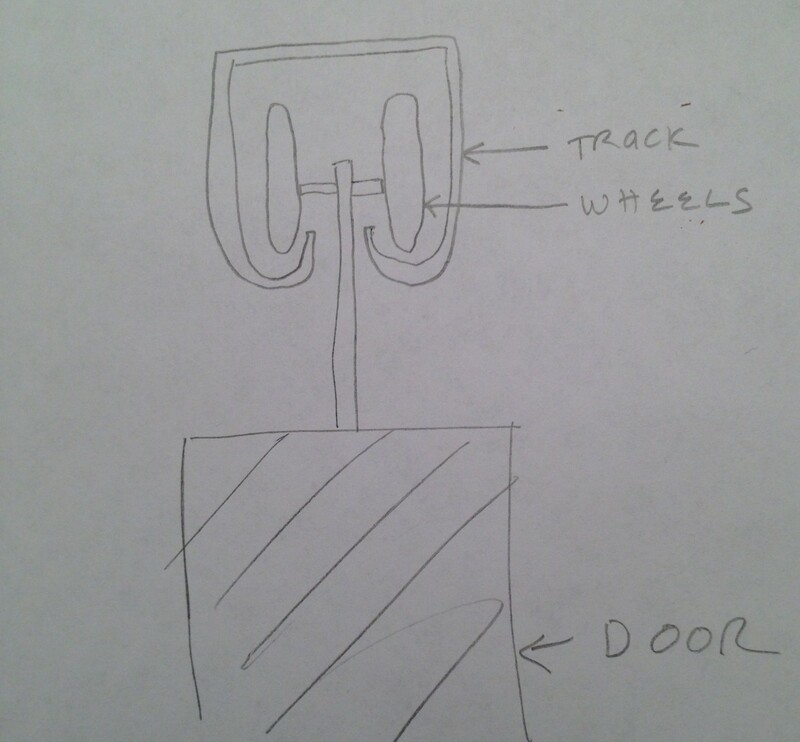 There is also a stop in the middle to prevent one door from sliding to the other side or allowing the rollers drop into the gap between the two tracks. Ross, are you familiar with Old House Journal? The quality is not quite what it once was but it goes back to the 1970s or 80s and is full of practical old house info. Unlike This Old House, OHJ does not promote short cuts that destroy historic value. Current issues are available online and good libraries will have bound volumes going all the way back. I know I’ve run across more than 1 great article on repairing pocket doors in its pages over the years. If you fast forward in my blog, you will see that all is now well! Magic has happened! My friend has a similar problem, has this inverted U track (Coburn type with #100 hangers (4-wheel style) He wanted to remove the doors for refinishing. The track is in two pieces, with one slightly longer than the other. 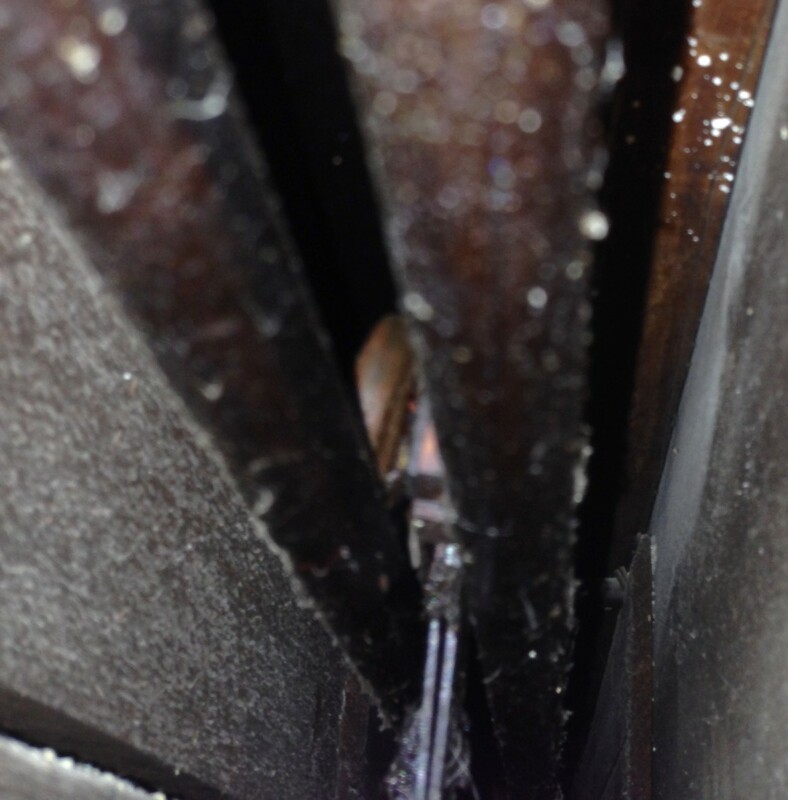 He pushed both door panels onto the other track, then removed the shorter track by removing the two screws that are accessible from the door opening, dropping the leading end down and sliding the back end of that track out of a receiver at the end of the pocket. We had great difficulty getting the first door panel off the track because in order to swing the door sideways, it has to be out of the pocket and the last wheels didn’t clear the track. We ended up damaging that hanger. The second door panel easily slid out of the track because the rear hanger was set further away from the end of the door. Makes me wonder why the leading hanger of the first panel wasn’t similarly located…. I bet Stephen would know the answer to your question!